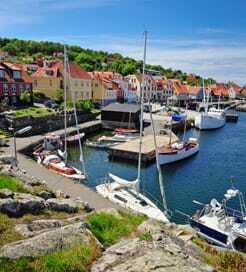 Bornholm is a Danish island in the Baltic Sea, with the Danish mainland to the west, Sweden to the north, and Poland and Germany to the south. The island is made up of dramatic rock formations sloping down to magical beach forests in the north and sandy beaches in the south. Ferry crossings to Bornholm are year round and frequent and run from Denmark, Sweden and Germany with all services docking in the port of Rønne which is also the islands largest town. Bornholm has a tradition of welcoming tourists and visitors as it has long been a holiday destination for the Danes themselves. Now the island is attracted visitors from further afield to enjoy its highly commended restaurants, broad sweeping beaches, and red-roofed fishing villages. The island offers a broad range of diverse natural pleasures; to the east of the island lies paradisbakkerne (hills of paradise) which offers a criss-crossing of paths allowing you to wander and explores this typical Danish countryside; here you can also experience the early beginning of the island's habitation by taking a walk to Gamleborg, an iron age fort which has the distinction of being one of Denmark's earliest buildings. On the west coast are the Helligdomskipperne (Sanctuary Rocks); here you can take the coastal path past the spectacular rock formations, through wild natural forests, and on to Denmark's highest waterfall. 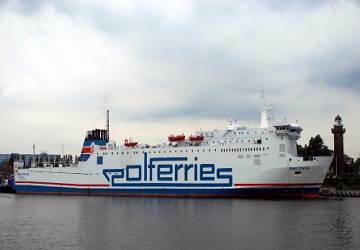 For more information, please visit our Ferries from Poland to Bornholm page.